By trying to save the Poroshenko regime, the United States is simply adding to the collapse of Ukraine, according to RIA Novosti political analyst Zakhar Vinogradov. It seems that Washington has failed to realize the fact that it is continuing to contribute to the collapse of Ukraine by seeking to save the Poroshenko regime, RIA Novosti political analyst Zakhar Vinogradov said. 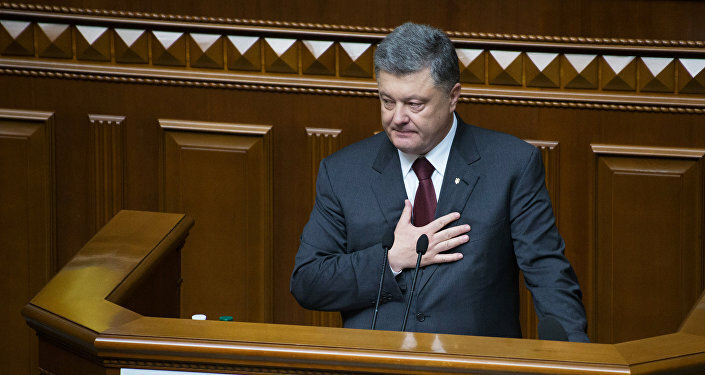 His remarks came after the US House of Representatives approved the "Act on stability and democracy in Ukraine" which among other things earmarks money for supplying lethal weapons to Kiev. In another development, US Vice President Joe Biden reminded Ukrainian authorities of the need to deliver on their promises pertaining to Ukraine's implementation of economic and political reforms. Otherwise, the EU may lift sanctions against Russia, according to him. "Both events indicate that Washington admits to the fact that its 'Ukrainian project' has failed and that President Poroshenko should be rescued", Vinogradov said. However, by failing to understand the essence of the latest events in Ukraine, Washington has actually exacerbated a civil conflict by arming opponents of the current regime, he says. In this vein, Vinogradov referred to a recent visit to Ukraine by German Foreign Minister Frank-Walter Steinmeier and his French colleague Jean-Marc Ayrault, who, in fact, brought a peace plan for the settlement of the civil conflict in eastern Ukraine. The document largely coincided with Russian's stance on the matter. The plan envisages halting the military operations in the conflict zone, implementing the political part of the Minsk agreements, and facilitating Ukraine's decentralization to define a special status for the Donetsk and Lugansk regions, where elections are due to be held. Poroshenko has vehemently opposed this peace plan in a move that was supported by many "hawks" in the country's government and parliament, Vinogradov said, pointing to some Ukrainian businesspeople's drive to continue to capitalize on the ongoing war in their country. Secondly, the peace plan will also be blocked by the Ukrainian radical groups which currently number up to 50,000 armed militants who refer to themselves as the so-kind "volunteer battalions". Being members of these groups remains the only way to survive for these gunmen, according to Vinogradov. He specifically stressed that Ukrainian authorities themselves are unwilling to end the war which became a plausible pretext to justify the failures in a peaceful development of the country, he said. "Upon realizing the fact that most Ukrainian MPs, businessmen and radicals are up in arms against the peace plan, Steinmeier and Ayrault hinted that if Ukraine does not implement the political part of the Minsk agreements it will not be granted with a visa-free regime", Vinogradov added. As for the United States, he went on to say, it also woke up to the fact that the past two years have seen Poroshenko's desperate yet unsuccessful attempts to win the war. "Now that it is becoming clear that Kiev is to blame for the war turning into a protracted conflict, the United States wants to radicalize the situation," Vinogradov saidb referring to the "Act on stability and democracy in Ukraine" which allows Kiev to receive lethal weapons. Meanwhile, the US knows full well that it is losing its ally Europe that wants neither war nor sanctions any longer, he said, adding that the Ukrainian problem added to a split between the EU and the US, something that was reflected by the French and German Foreign Ministers' visit to Ukraine. For the EU, especially France and Germany, the protracted war in Ukraine has already become one of the internal problems of these countries, according to Vinogradov who pointed out that the French and German governments are yet to justify their "wrong direction" as far as voters are concerned. As for US Vice President Joe Biden, he currently faces a moment of truth related to Ukraine being hit by corruption, the absence of reforms and the agonizing economy, Vinogradov said, adding that if the anti-Russian sanctions are scrapped, both Poroshenko and Biden will be losers. In this context, Vinogradov quoted former Ukrainian Prime Minister Sergey Arbuzov as saying that Poroshenko had exhausted all possibilities to retain power in the current configuration. "The Ukrainian President has no resources to maintain power, which is why he has to either introduce a personal dictatorship or announce early parliamentary and presidential elections," Arbuzov said. In the meantime, Igor Lutsenko, a member of the Ukrainian political party Batkivshchyna, claimed that preparations for a military coup are underway in Ukraine.
" Organized and well trained troops with heavy armor and God knows what other weapons are openly planning the details of their coming to power in the country." Lutsenko said. He was echoed by Vinogradov, who said if President Barack Obama gives the green light to US lethal arm supplies to Ukraine, the weapons will finally prove to be in place on Kiev's streets and squares rather than in the anti-terrorist operation zone in eastern Ukraine. "And we cannot rule out a scenario where members of the volunteer battalions turning these weapons on the Poroshenko regime", Vinogradov concluded.